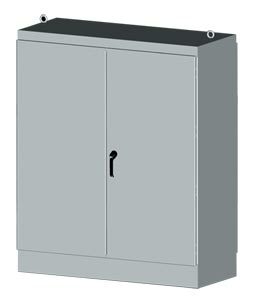 NEMA Type 3R & 12 Free-Standing, Two-Door Dual-Access Electrical Enclosures and Cabinets - Sizes from 72x48 to 90x72"
The SCE-FSDAD Series indoor/outdoor electrical enclosures are designed to house electrical and electronic controls, instruments and equipment in areas which may be regularly hosed down or are in very wet conditions. These electrical control panels provide protection from dust, dirt, oil and water. This outdoor electrical control panel is the solution for waterproof and weatherproof applications. The enclosures are extra deep with front and rear access for applications requiring more interior space and have provisions for optional surface mounting or rack mounting of almost any type of equipment. White powder coating inside and ANSI-61 recoatable gray finish outside over phosphatized surfaces. Optional panels are powder coated white.